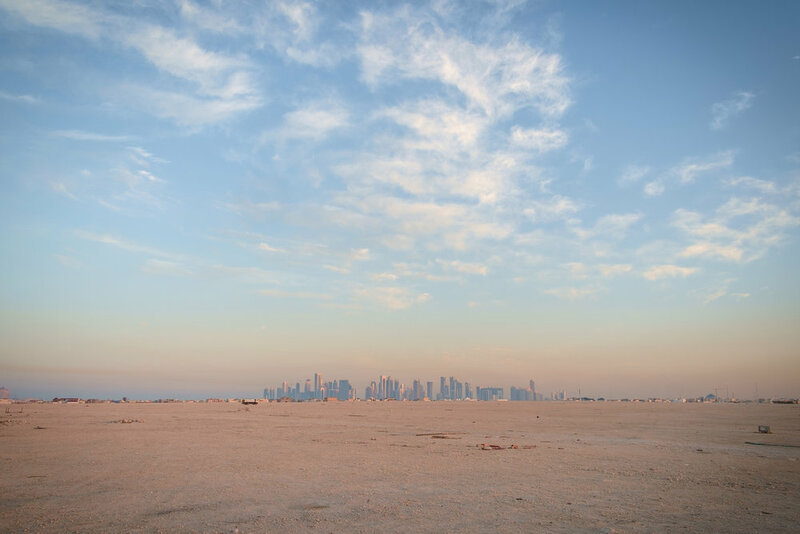 West Bay, Doha’s business district and iconic skyline, is seen in the distance. A Mercedes-Benz and a sewage truck are seen in a dust storm on the northern edge of Doha. A construction scene on The Pearl with the Viva Bahriya Towers residential development in the background. The Pearl is an artificial island comprising of luxury residential estates and businesses. It is the first land in Qatar made available for ownership by foreign nationals. The ubiquitous semi truck, this one carrying water, is seen at sunset leaving massive construction site on the outskirts of Doha. The ubiquitous semi truck, this one carrying water, is seen at sunrise at a massive construction site just north of Lusail City. A street scene in the old Musheireb neighborhood of Doha with the new Msheireb development rising above it. Much of this old part of Doha has been torn down as Qatar races to revitalize and modernize in time to host the 2022 FIFA World Cup. Living in Doha, means living in a veritable construction site. The landscape often changes as roads are laid and developments are realized. Part construction scene, part camel pen at Souq Waqif in Doha. Qatar is in a race to revitalize and modernize in time to host the 2022 FIFA World Cup. A boy and his neighbor are seen in the old Musheireb neighborhood of Doha. 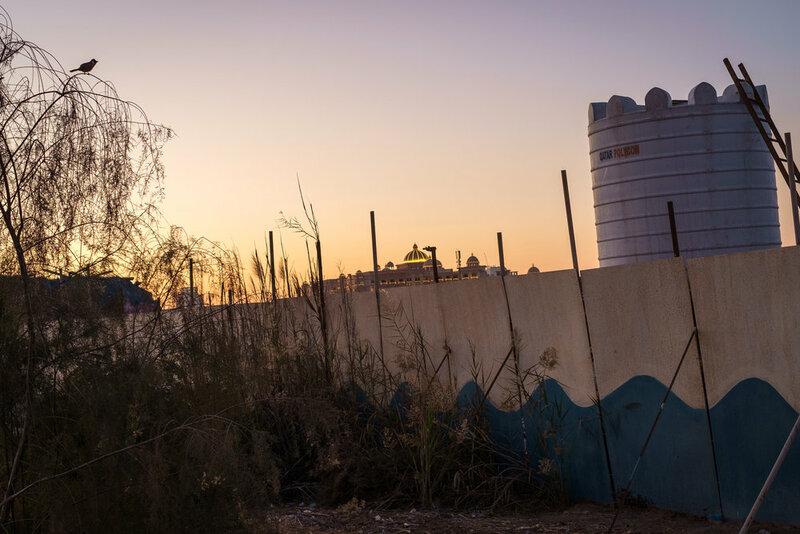 Much of this neighborhood has been torn down, and the residents forcibly removed, in order to build the New Msheireb development. Qatar is in a race to revitalize and modernize in time to host the 2022 FIFA World Cup. A man is framed by branches of a tree on the streets of the Al Waab district of Doha. A massive mound of dirt and rock, echoing a half-built pyramid, is seen at a construction site just north of Doha. A mosque is seen in the old Musheireb neighborhood of central Doha. Much of this neighborhood has been torn down, and the residents forcibly removed, in order to build the New Msheireb development. Qatar is in a race to revitalize and modernize in time to host the 2022 FIFA World Cup. A blue-collar expat is seen in the old Musheireb neighborhood of Doha. Much of this neighborhood has been torn down, and the residents forcibly removed, in order to build the New Msheireb development. Qatar is in a race to revitalize and modernize in time to host the 2022 FIFA World Cup. A scene of one of the back streets of the old Musheireb neighborhood in Doha. Much of this neighborhood has been torn down, and the residents forcibly removed, in order to build the New Msheireb development. Qatar is in a race to revitalize and modernize in time to host the 2022 FIFA World Cup. The door of a residential compound in the old Musheireb neighborhood of Doha. Much of this neighborhood has been torn down, and the residents forcibly removed, in order to build the New Msheireb development. Qatar is in a race to revitalize and modernize in time to host the 2022 FIFA World Cup. The moon is seen rising above the desert in Zekreet at dusk. Looking out across the water from a construction site on The Pearl, the skyline of Doha’s West Bay neighborhood is barely seen through the haze at sunset. Construction of a residential tower at the Viva Bahriya development on The Pearl is seen in the evening. The Pearl is an artificial island comprising of luxury residential estates and businesses. It is the first land in Qatar made available for ownership by foreign nationals. A construction site for the Arab Center for Research and Policy Studies is seen through a crack in the partition. A private home is seen mid-way through its construction phase. The ubiquitous semi truck is seen at the end of the day leaving a massive construction site on the outskirts of Doha. The skyline of West Bay is seen in the distance. Living in Doha, means living in a veritable construction site. The landscape often changes as roads are laid and developments are realized. Dumpster trucks are lined up on their day off as the sun sets behind them. Desert dust is often in the air creating an other-worldly atmosphere. The roof of the Marsa Malaz Kempinski hotel is seen in the distance from a construction site on The Pearl in Doha. The Pearl is an artificial island comprising of luxury residential estates and businesses. It is the first land in Qatar made available for ownership by foreign nationals.